It's Raining, It's Pouring...And The Boys Are Ready To Play! If it’s not raining in your neck of the woods now, chances are it will be soon! It’s that time of year again, the time when water falls from the sky and children beg to go out and play in it. 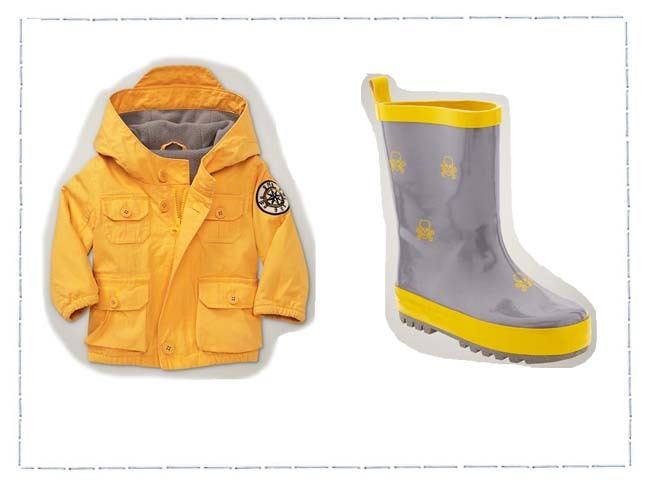 Dress your little guy in these mom-approved items and allow him to romp, stomp and play all he wants! This Gap hooded rain jacket ($49.95) has all the important features to keep your child warm and protected from the elements. This easy to spot rain jacket has a hood with protective bill, banded arm cuffs and it doubles as a winter jacket with the soft and warm fleece interior. These skull and crossbones rain boots ($29.95) have a glossy, grey outer with digital looking skull and crossbones scattered all over. 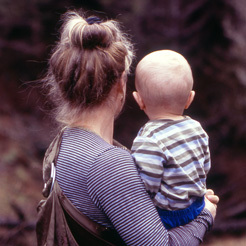 Your child will find these boots easy to pull on thanks to the extra tab located in the back. The textured rubber soles make these boots safe on the slick sidewalks. What little boy wouldn’t love this Batman umbrella ($15.95)? 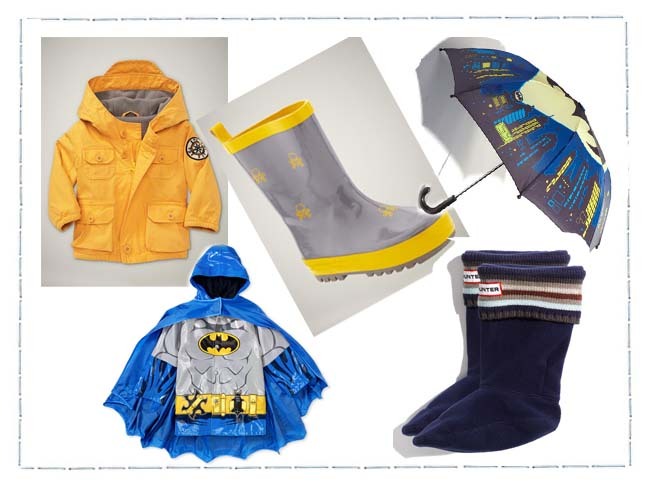 With the Gotham City skyline above his head, your son will love being out in the rain posed as a famous superhero. 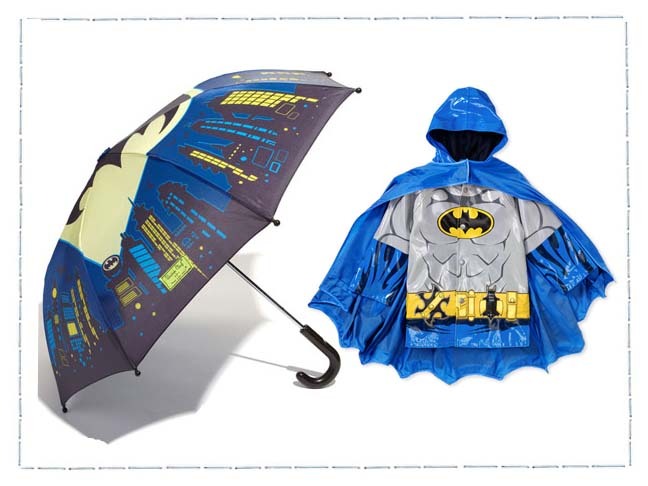 Your little crime-fighter will be dry in this fun Batman Raincoat ($49.99). The moisture-absorbent lining and full hood keeps your son warm and dry while the removable cape adds some fun — like kids need another excuse to have fun in the rain?! 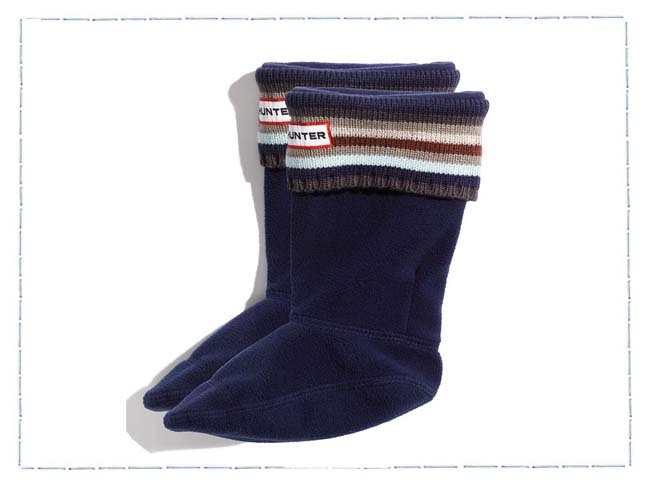 These Hunter cuff socks ($20) fit inside Hunter (and other) rain boots to provide added warmth and comfort. The striped, fold-over top also adds some style and personality to plain or old boots.